If you had told me when I set a goal at the beginning of this year that I would be running a half-marathon in the Fall, there is a very good chance I would have laughed in your face. Even though back in January, I did have hopes of possibly (maybe) running the Disney Princess Half Marathon, I knew that wouldn’t be until next year and I would have well over a year to prepare. I didn’t want to commit to even that because running has been such a fight for me. But then I turned a corner and I finally liked it. Then I started to look forward to it. And then I got some cute gear and I ran faster and longer than I ever have in my life. And I accepted that I have won. I am there. I am a runner. That’s about the time the self-sabotage set in. And birthday season rolled up with a trunk full of cupcakes and well, before you could say all you can eat sushi, I hadn’t run in two weeks. For someone who is supposed to be training for a half marathon, 2 weeks is an eternity. The first day I finally got back to it was like starting over. But then a few minutes passed and I was right back into it. That week I PR’d (personal record) and I was actually excited to get back in the game, which even now is shocking to me. In the past when self-sabotage would sneak up on me, I felt almost powerless to fight it or by the time I realized what was happening, I wanted to just give up because it was too familiar. However, this year I am really trying to fight my bad habits. I am owning them and deciding one by one if I am going to continue to let them make choices that lead to places I don’t want to go. I am surrounding myself with people and books that inspire me in my faith to make good choices and go to great places. I want to be a great example for my kids. I want to BE here for my kids. I don’t know if you’ve seen the little button at the bottom of this page, but it says Fitfluential Ambassador. This year, I have partnered with the Fitfluential team to commit to making these changes for my health. Just having that little button down there is a constant reminder that I am choosing to do this each time I lace up my sneakers. 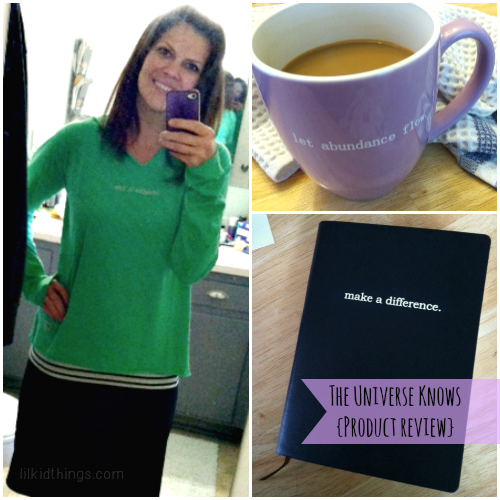 As a part of the Fitfluential community, I was given the opportunity to review some fun gear from The Universe Knows. I had no idea what they would send me, but an amazing box appeared on my doorstep right in the middle of my 2-week running hiatus and it could not have come at a better time. 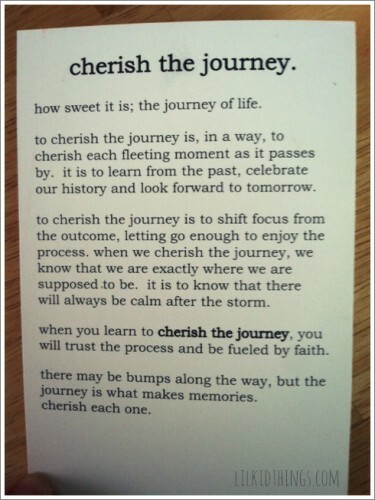 In fact, that little cherish the journey card was the first thing I saw when I opened the package and I knew it was only going to get better. The Universe Knows is an online shop that sells what they call “inspiration wear” but it’s not just clothing. They have journals, mugs, and even onesies for the kids! I was sent three items from the shop and each phrase is a reminder that I am on the right track. It’s so funny to me that they sent these words, because summed up that is exactly what I am trying to do this year. It’s amazing how my brain reacts to seeing these little bits of encouragement when I am doing normal things like drinking my morning coffee. And the products are great quality! I definitely plan to grab a couple more mugs (because I might be addicted) and I know my hoodie will get mad use this Fall. It’s really soft and the words are embroidered rather than printed so I know it will last! The Universe Knows offers free shipping on orders over $75 and if you sign up for their newsletter, you will get 10% off your first order! Everyone needs a little inspiration right? *Thank you to The Universe Knows for providing the above-mentioned items for this review. All opinions are my own.